If you’re moving to West University Place, congratulations! This is one of the most affluent communities in the United States. And in a city where River Oaks is right next door, that’s an impressive feat. the 610 Loop, so it is close to everything without feeling like it is in the middle of everything. This makes the community a primary destination for families headed by high powered professionals, including doctors and attorneys. With some of the city’s best schools here, as well as plenty of family-friendly things to do, the area is ideal for many families. West University Place is extremely compact, encompassing only a couple square miles. River Oaks is to the north, the Medical Center and Museum District is to the east, Bellaire is to the west and Braeswood is to the south. It sits near the intersection of the 610 Loop and I-69, so it’s easy to get anywhere from here. And, even better, there are only a couple of significant roads that run through the area, so traffic is minimal outside of peak times. Again, this is one of the most affluent, wealthiest neighborhoods in all of America. That may seem hard to believe, because similar high profile neighborhoods are practically known by name, but consider this – West University Place, according to a 2011 survey, had the fifth-highest number of households with incomes of $150,000 or greater, in the entire nation. Among the community’s inhabitants, a whopping 85 percent have bachelor’s degrees, which is the highest number among communities in the southern United States. There is a lot of power here, both financial and brainpower. The area is also home to many of the city’s major figures, including athletes and performers. West University Place is adjacent to the Rice University campus, hence its name. Rice is among the most prestigious and exclusive universities in the U.S., which adds to the area’s distinguished status even further. And in addition to Rice University is Rice Village, which is also adjacent to the community. Rice Village is a popular spot for hungry and adventurous types from all over the city, and is within walking distance of the area. Rice Village has a mix of cuisine offerings, as well as both luxury and bohemian shops. There’s also a theatre here for those looking for an easy to get to performance, as well as several popular nightlife spots. On the other side of Rice University is the Museum District and Hermann Park, both of which are perfect for families. Between the Houston Zoo, Museum of Fine Arts, Museum of Natural Science, Children’s Museum, and a dozen more museums in the area, there’s never a shortage of things to do here. The area’s central location gives it immediate access to other attractions inside the 610 Loop, like the Menil Collection, Memorial Park, multiple major music venues close to and inside of Downtown, as well as quick access to football (Texans), baseball (Astros) or basketball (Rockets) games. The community has also committed several million dollars to developing its parks and recreation center, which could be fairly described as an upscale YMCA. West University Place is so small that it doesn’t have many schools, but its sole elementary school is one of the best rated in all of Houston, with an active parent/teacher organization. The school is a focus for many of the families in the area. And there are plenty of families. As of the 2010 census, nearly half of all households had children under the age of 18, which makes it one of the most family-centric neighborhoods inside of Houston. Families moving here inevitably find that the area is unified by its focus on families and community building. There’s a belief, supported by journalists that cover the area, that people in the community don’t care what your political affiliation is or how you feel about contentious issues, as long as you show up to community events and support the area. That’s something most people can stand behind. 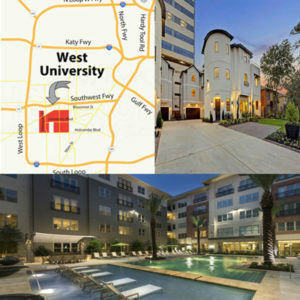 Although West University Place may feel like a separate entity, it is right in the middle of Houston, so people living here have to contend with the city’s notorious sprawl and spiraling design. The area itself is not tough to navigate, as it’s mostly a grid, but navigation isn’t the challenge. The challenge is that the majority of people moving to West University Place are moving into a large home. The median home size in the community is close to 4,000 square feet, which is far above the median found in most other Houston communities. It’s quite an undertaking to move everything into a house of this size, especially if there are enough personal belongings to fill up the entire house. In all likelihood, it’s too much for a single family to handle on their own, but fortunately, a family doesn’t have to handle it on their own. A professional, experienced Houston mover like JT Melia is equipped to efficiently execute moves at this scale, so it will always have enough manpower, truck space and equipment to move everything into the new property. And JT Melia will arrange everything in the new home before calling the job done, so new West University Place residents can get acquainted with their new community right away.